Navratri is the main festival of Gujarat celebrated nine days across India as well as other foreign countries where Indian community lives. This festival is celebrated for several reasons across the globe but one of the most reason is for the victory of good over evil. The majority of Indian locality especially Gujarati dance the Garba and play dandiya every night by wearing variant styled traditional chaniya choli along with matching accessories to please Goddess Durga. Few of people, prepare each day chaniya choli and step out of the home with smart collections. Fashion is changing now and then. Navratri costume designer always come up with modern designs so Navratri dresses have completely changed than previous was being worn. Also, the draping style of dupatta has modified that gives the charming appearance to any lady. But, bright colors like red, black, yellow, etc. are still on trend with innovative patterns. Heavily worked designed are replaced by printed and sober work. Who doesn’t want to look fabulous at this festival which is well-known for showing your wardrobe collections? If you’re confused about what to wear, you are at the right place. This SareeO blog will take you through the journey of trendy collections. Combine the kachhi worked brighter shades kediya style blouse with stylish dhoti if you wish to catch the attention. 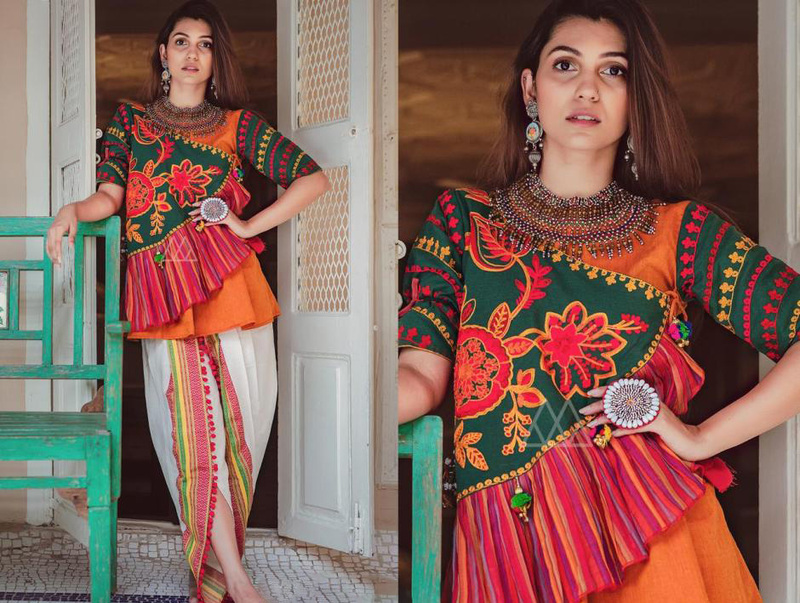 Multi-border with pom pom lace dhoti and 3/4 sleeve give an aesthetic glance. Have on long earring with the matching ring and colorful necklace for a striking look. Navratri dressmaker designed this for those who are looking for simple and stylish chaniya choli. String along with jhumka gives regal look and doesn’t require any waist belt. Dull polished matching accessories adds grace. Absolutely amazing casual styled chaniya choli is suitable to all kind of ladies. Traditional dyeing techniques are being used in which the thread is dyed before weaving. This is made from one of the oldest forms of textile that gives unique ethnic patterns. One of the best quality of this chaniya choli is the “smooth fabric & its durability.” Because of the usage of fabric, it can look like a saree. Multicolor double layered with full flare with tussle & exquisitely printed blouse dramatically change the appearance. Boat neck blouse along with off shoulder blouse suits to those are slim. Combination of plain red & mustered dupatta with this choli is fantastic. Minimal makeup and open hairstyle can be suited. 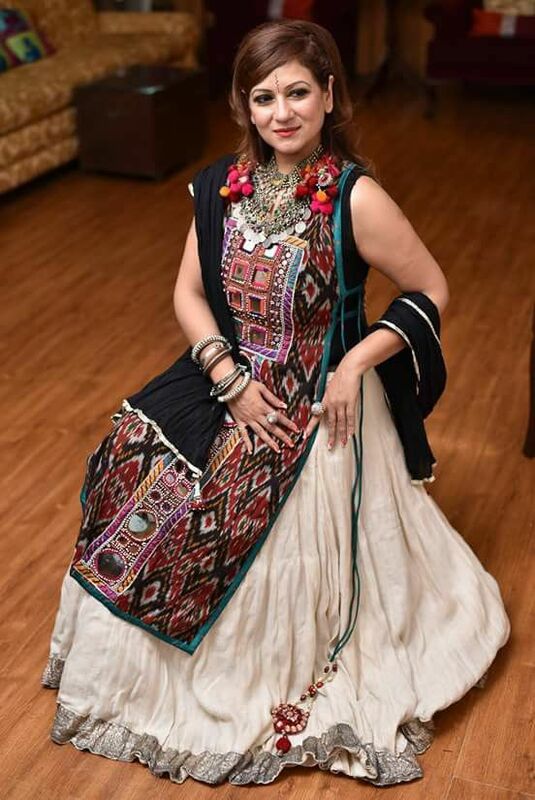 Handworked kurta with fully flared cotton chaniya with silver border & black dupatta is a unique combination that gives you traditional look. You can either pair it with a simple pant or fully flared chaniya. People from western culture generally prefer as it is not heavy and still giving the heavy appearance. It stuns your look by wearing metal matching ornaments. 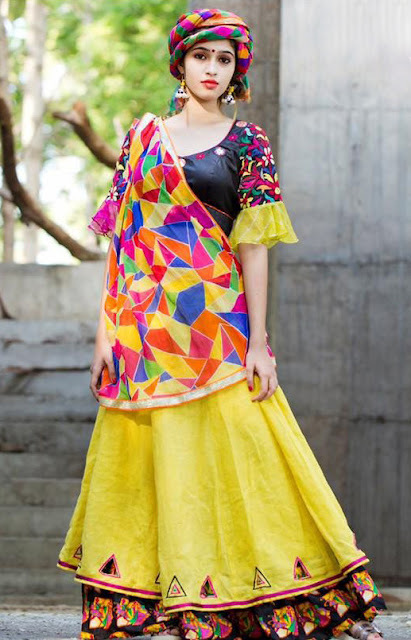 Multitringle printed double layered multicolor chaniya choli with anika sleeve black blouse makes you elegant. Fashion designer designed matching colorful turbine to wear along with chaniya choli especially to take part in the competition. Wear long earrings to have an extraordinary appearance. 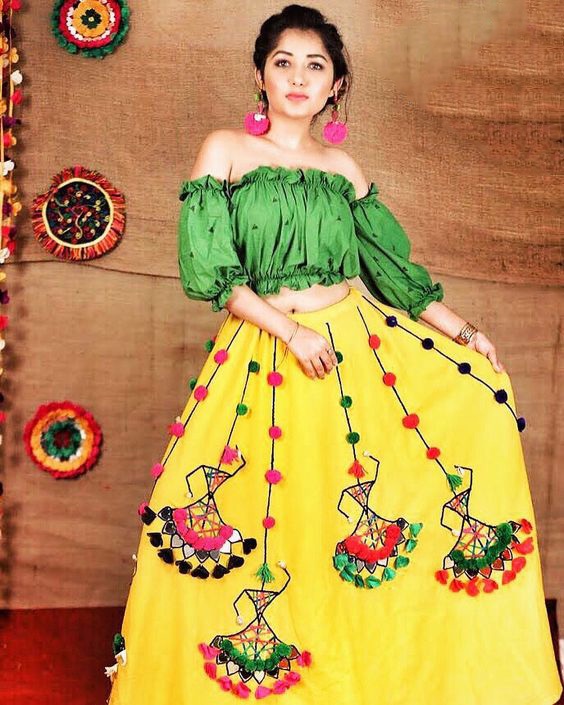 Select this innovative design for Navratri 2018! Go for pine green & beige color hand embroidery worked blouse & dupatta with flared chaniya choli. Tassels at the end of dupatta as well as sides of chaniya provide uniqueness to this chaniya choli. If you’re looking for trendy and stylish choli, select this opulent outfit. Braiden with this attire and minimal ornaments add the value. 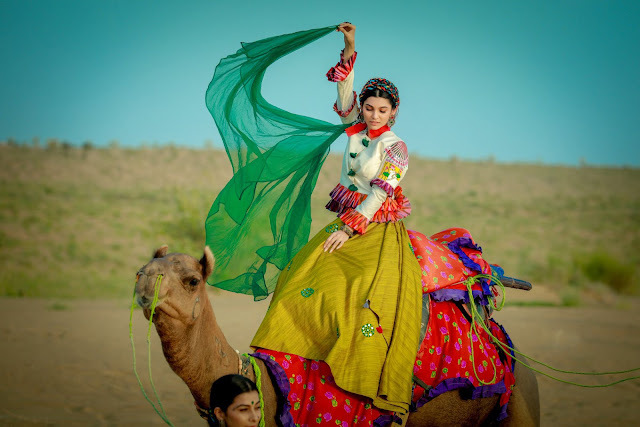 This green shade traditional embroidery work chaniya with patchwork is perfect for those have a fair complexion and willing not to show skin. Nothing would be stylish than this sophisticated layered motif blouse design along with dark green chiffon dupatta & pompoms are attached at the end of chaniya. 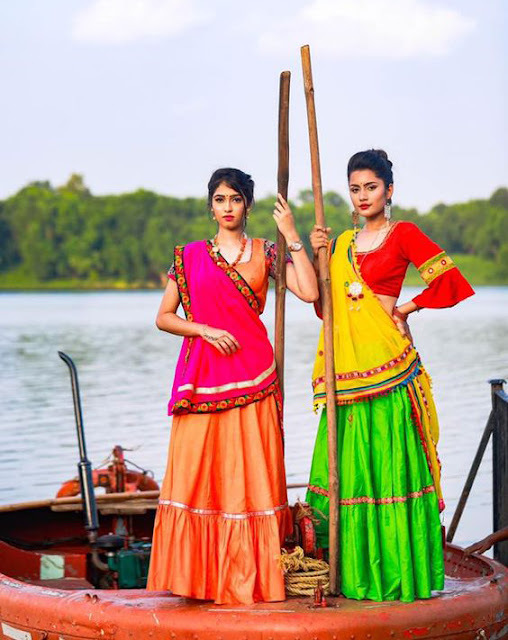 Be center of attraction by wearing Twins Navratri Collections – Embroidery worked orange blouse with a pink georgette dupatta with kachhi lace work & Parrot green frilled chaniya with the bell sleeves red blouse having embroidery border. Yellow mirror work dupatta is an impressive view. Bright shades off the shoulder top with balloon sleeve is trendy at this moment. This Navratri special is certainly priceless. Matching earrings with high heels adorn your look. Visit our Indian ethnic wear website SareeO to buy latest and trendy Navratri chaniya choli collections with free shipping & exciting seasonal offers.